Picture this: it’s late morning, and the blazing sun is beating down on a wide two-lane strip of asphalt. The VHT surfacing resin on the ground below you is sticky enough to pull the shoes off your feet if you weren’t tightly cocooned in a tube-frame cockpit encased in a thin fiberglass body. Fumes from the nitromethane fuel pumping through the supercharged V8 engine sting your nostrils and bring tears to your eyes. The light on the staging tree ahead of you flashes green, and in an instant, the tires behind you catch traction and rocket you forward. The acceleration is so violent that your field of vision narrows to a pinhole, as your brain’s blood supply pools in the back of your head. Less than four seconds later, you’re 1,000 feet from where you started, traveling at well over 300 miles per hour. This is the world of NHRA Funny Cars—a world that legendary racing driver John Force has become synonymous with over the past four decades. John Force is by far the winningest driver in NHRA drag racing history with 16 championships and 149 race victories to his name. 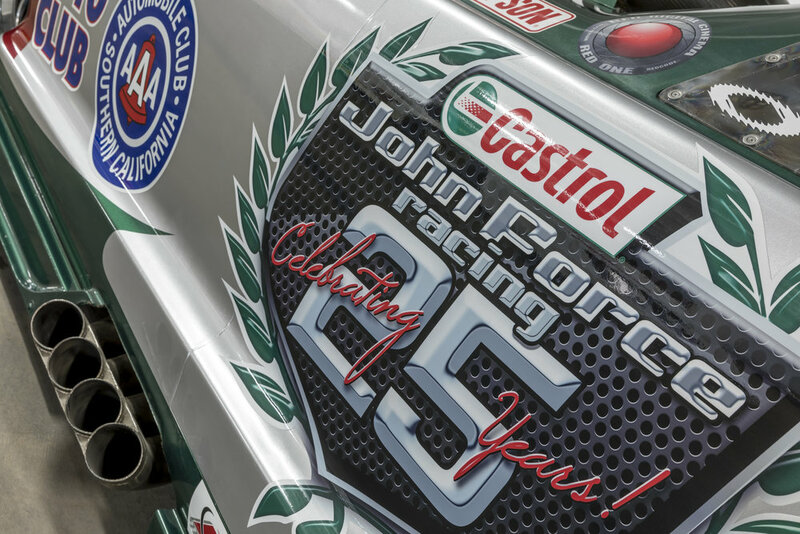 This particular racing car, the 2008 John Force Racing Ford Mustang 25th Anniversary Funny Car, represents an important moment in Force’s career and the sport of drag racing at large. After the tragic death of fellow NHRA Funny Car driver Scott Kalitta during the 2008 season, Force took it upon himself to improve safety for the class. Alongside fellow drivers Dave Lahey, Kenny Bernstein, and Tony Schumacher, Force developed an engine sensor system that automatically shuts down the fuel pump and deploys drag parachutes in the event of an engine backfire. This car was one of the very first equipped with the system, and it soon became standard equipment for all competitors. In addition to technical changes to the cars themselves, the accident forced the NHRA to reconsider track safety measures. These changes included padded retaining walls for end-of-course sand runoff areas and the end of the traditional quarter-mile (1,320-foot) race distance in favor of shorter 1,000-foot races. Although Force finished seventh in the 2008 points standings, his efforts to make the sport safer for all make the 2008 John Force Racing Ford Mustang 25th Anniversary Funny Car one of the most important cars in the history of drag racing. The car comes to the Petersen Automotive Museum as the gift of John Force himself. This generous donation currently resides in The Vault, available for viewing by thousands of visitors each year.